Digging deep into the minds of retail brands and their customers to help transcend from online discovery to the in-store experience. How might we better understand our customers journey from a range of touch points, to connect, become verified and engage with the Raincheck™ app and technology. Discovering that we had multiple pain points across all user journey’s lead us to explore and gain insight into the user experience. 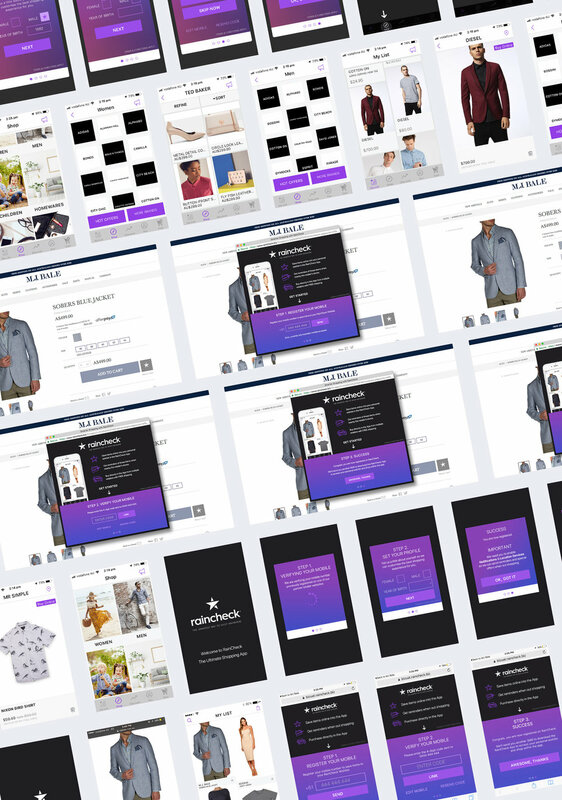 By creating seamless journey’s, the user can easily verify and connect to products, brands within the Raincheck™ platform. 01. To research and discover each of our users pain points in each user journey. 02. Simplify and streamline the user experience to its core. 03. Synchronise the visual design consistency and design assets. 04. Develop the brand by evaluating the identity and creating an overall brand. 05. Guide the user to further understand the power of the Raincheck™ technology and its mission. Taking a step back to view the entire system as a whole allowed me to break it down into phases, which made actioning the highest value and most efficient items to be completed swiftly. This project allowed me to understand not only the pace and processes of a very successful startup, but also learnt a lot about new technology, in beacon technology, geolocation marketing, O2O (Online to Offline) Strategy. We ran multiple design sprints and workshops to better understand our users and there journey’s, experiences, feelings and pain points. Creating a seamless process for the user to verify themselves with the platform (through SMS technology), and begin saving items online to then receive notifications when out shopping in the real world was the overall goal, which I feel we achieved. Also, at this time, I rebranded the company giving them a unified set of visual assets and clear messaging to help them tell their story.